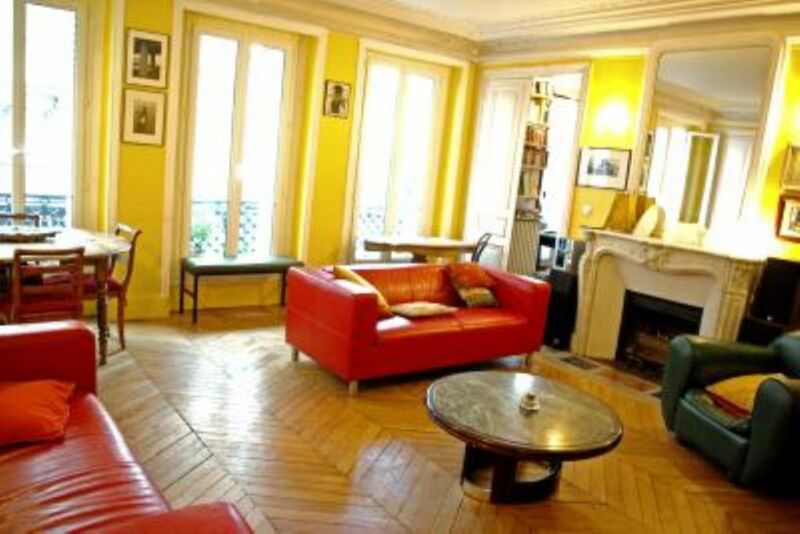 In the heart of Paris, Place de la république, roomy apartment 140 m2, with 6 rooms, on the 1st floor, for 7 or 8 people. A great friendly dining room, 4 bedrooms (2 double beds and 4 simple beds), 2 WC, a bathroom, a shower, television, DVD, web, telephone, libraries, washing machine, dryer, dishwasher, refrigerator, freezer, hairdryer, iron, provided sheets and linen. 3 adults velos, 2 vélos for 8-9 years old childrens. Near to "Grands Boulevards" cinémas and theatres, 10mn Centre Georges Pompidou. We had a great time staying at Catherine's place. She was very quick to get in touch if needed and the housekeeper explained all the important things regarding the place when we checked in. The place felt huge for the six of us and had a lovely quality about it. The location was excellent for getting around Paris with 3 metro stations nearby. The kitchen had all the equipment if you needed to cook. Overall, there were only some small things that a very picky person would find a big problem with. E.g. one of the shower heads and a couple of doorknobs weren't well maintained, and one of bedrooms was pretty dark. But we would definitely stay again when we're in Paris next time. Locataire charmant, communicatif et auquel on peut faire confiance pour louer sa maison! Leuk ruim appartement op prima plek in centrum Parijs. Sanitair is versleten, verwarming was uitgeschakeld. "Merci aux propriétaires Catherine et Bernard pour leurs assistance lors de notre séjour a Paris. Ils étaient disponibles pour répondre à nos questions et le logement était bien situé, près du métro, restaurant etc. L’appartement était propre et spacieux nous avions l’impression d’être chez nous!" "Appartamento confortevole e caratteristico. Forse un po'' trasandato, ma comunque piacevole e comodo (a parte il letto matrimoniale....durissimo!). Peccato non aver avuto l''uso della TV e di internet. Cucina ben equipaggiata. Nel complesso siamo stati benissimo e ci torneremmo di sicuro!" "Beautiful home....perfect contest and all!!!! I0d like to come back in Pasis :-)"
"Super appartement bien situé dans Paris."